Jim Svejda is celebrating his 40th year at KUSC. Every weeknight, loyal listeners join him from 7 p.m. to midnight to hear his engaging musical choices and commentary. Jim is also host and producer of the syndicated radio series The Record Shelf which is carried by public radio stations in the U.S. and is heard on KUSC on Sunday evenings from 10 p.m. to 11 p.m.
Jim was born in Michigan in 1947. He is a trained musician and earned a Master’s degree in English from Syracuse University. His early career was spent at WONO in Syracuse, New York; WCRB in Boston, Massachusetts and with Public Broadcasting Associates in Berkeley, California. Luckily for KUSC and our listeners, he found his way to KUSC in 1978 where he started as Executive Producer. And the rest is history. While Jim is one of the most respected, critical voices in the classical music field, he also is one of the most entertaining and popular program hosts on public radio. 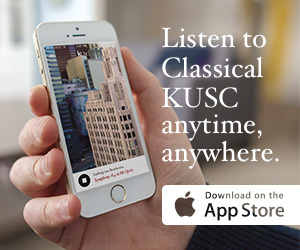 For the past 40 years, Jim has delighted Classical KUSC listeners with his witty, meticulously crafted commentaries on diverse composers, conductors and artists as well as a wide range of other subjects that attract his musical fancy. Jim Svejda: Between the Notes was chosen as one of a handful of shorts featured during the LA Shorts International Film Festival. The film celebrates Svejda’s 40th anniversary with KUSC and also recognizes his status as one of the most knowledgeable classical music hosts in the country. Join us as we celebrate 40 incredible years of Jim Svejda!